No dues increase with proposed budget. AFA is operating within our means, which is good. But, the Finance and Budget committees believe that it is prudent to save money and prepare for upcoming costs in the future (Local Elections, for example) A contingency plan to establish a saving account and save 400k per year is proposed and this will ensure that the reserve account stays in tact. SBA is fully funded as are Negotiations budgets. This budget even allows the hiring of another staff attorney and a staff negotiator. · Why was the dues procedure changed for new hires? It was voted on the past BOD that new hires will begin to pay due in their first full 4th month of service. Did away with the initiation fee and provides reserves the ability to run for office and actively participate in union elections sooner. · BOD Budget was unanimously voted in by Council 19 members present. · OS TIcketing went live and you can file a ticket via the system. · Membership on track and declining. This is Linda’s last term as LEC Secretary-Treasurer, but she is already serving in her new role as the MEC Secretary-Treasurer. · Guest Brian Mason, Unite Here, presented information about the fight for $15.00 and on-going issues with Alaska Airlines to pay workers. Seattle FAs pledge to help in any way that they can. Members in Good Standing are invited to attend the meeting. Parking is free at the hotel and shuttle service is available from the airport via Hampton Inn or MVP Shuttle (to AS Flight Ops building only). There is a lot happening right now and we want to try and address your questions and any rumors that are out on the line. It’s important to remember there are resources available to you, along with your LEC Officers, where you can find answers to your questions. It’s important that we curtail rumors and bad info on the line and address issues with factual responses! We hope that this newsletter addresses the top concerns and provides you with the necessary resources to seek your answers, too. 2. Call MVP shuttle (206) 243-3211. MVP is available for AS employees with their ID. The shuttle will drop you off at the Flight Ops building (just across from the hotel). If you are driving to the meeting, parking at the hotel is free. Andy Schneider has confirmed that she will attend the meeting to discuss recent concerns with Crew Access. Your current LEC Officers and the LEC Officer-Elects have been working together over the past month training and transitioning for the new officer term, which begins July 1, 2017. Starting in June, LEC President Officer-Elect, Terry Taylor, will be included in all local base communication. This means that Terry will be cc’d in on all emails, alerted to texts, and updates with phone calls that the current LEC President, Laura Masserant, receives. This will ensure that Terry is up to speed on all events/issues that affect the Flight Attendants of Council 19. Also, beginning June 1, Terry will be the point person for all performance meetings. Laura will step down from all performance/grievance related issues to ensure continuity of the grievance process during the transition process. Melissa and James are answering questions in their updates, such as: VX travel, merger and integration appointees for VX FAS, along with a multitude of other questions. It’s a good rule of thumb for all of us to stay up to date with our brothers and sisters by adding Council 35 to your AFA newsletter preferences and receive their newsletters (see how to do this below). Section X.C.2.a.(2). of the AFA-CWA C&B ensures that, “…the ‘seniority date’ of a Flight Attendant shall be the date from which each Flight Attendant accrues competitive (bidding) seniority as a Flight Attendant as of the date of the merger agreement between the affected airlines.” The term “date-of-hire” is common terminology among Flight Attendants and is the principle contained within the C&B. This term describes our principle but not the actual wording that refers to bidding seniority. How can I receive newsletters from other councils? It’s easy! Simply locate the manage your subscription link located at the bottom of every AFA newsletter that you receive and add councils to your subscription list. You can add all AS/VX councils, as well as other airline councils who participate in the newsletter system. AFA and management have agreed to adjust the trip trading dates so that Flight Attendant-to-Flight Attendant trades will no longer occur on the same day as Open Time. This is effective in June for July trading. Because Flight Attendants did not have an opportunity to bid for the new trading dates in June, the parties have agreed to keep Open Time trading on the 15th and instead move FA-to-FA trading up a day to the 14th. Starting in July for August trading and beyond, FA-to-FA trades will go back to the contractual trading date of the 15th and Open Time trading will occur a day later on the 16th. Your officers hope that you find this information helpful. Remember, you can reach us at sea@afaalaska.org. We are offering additional training classes in Crew Access beginning May 1, 2017. We encourage FAs to attend who may need a little more help understanding Crew Access. Topics that could benefit FAs attending class would include: Setting up Personal Filters, Text Alerts, How to post for grab, Direct Trade, and SIP/SPLIT trips. Also, we will cover what options are in your Reports and how to utilize them for best benefit. 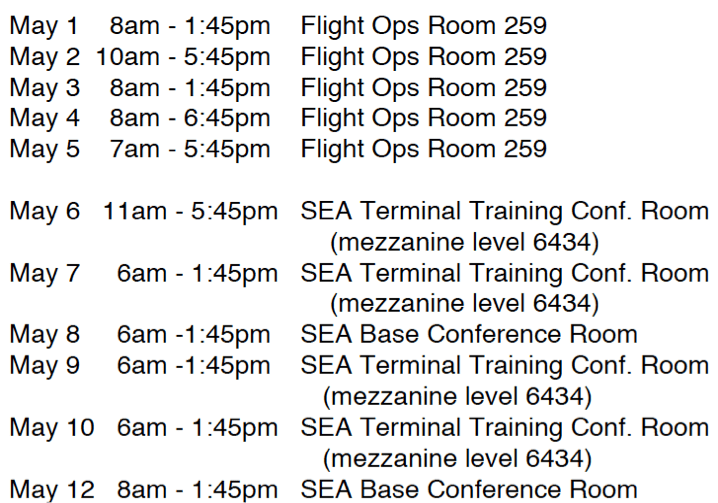 Additional benefit for FAs this time are that classes are offered BOTH at Airport and at the Flights Ops building this time! 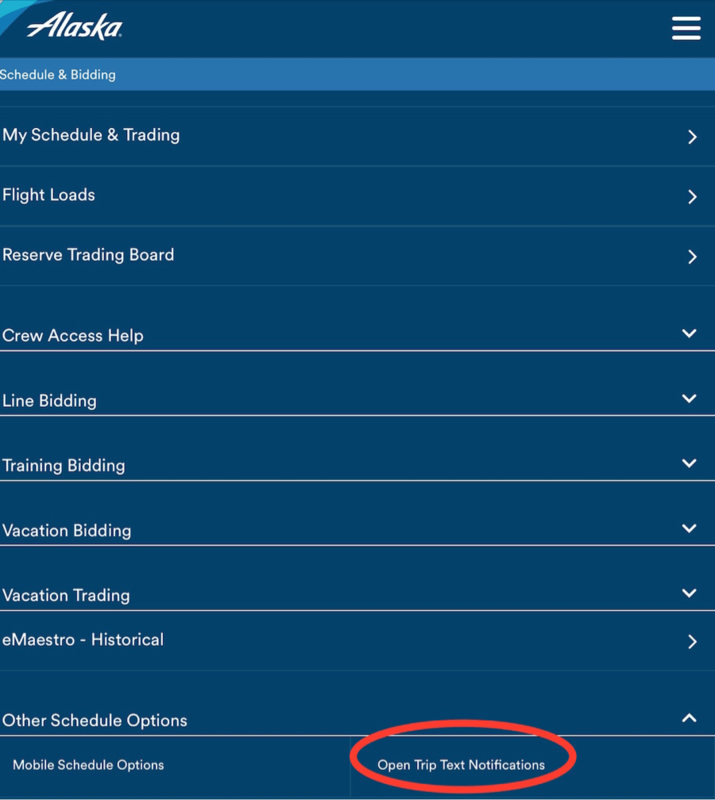 Did you know with Crew Access you have the ability to create Filters for up to 5 TEXT ALERT SUBSCRIPTIONS? You also have the ability to create numerous personal filters when searching Crew Access to navigate easier viewing when searching for specific days, trips, layover cities or FA position. Filters can be a one use option or saved for future use and ease when searching in Crew Access and deleted anytime at your discretion. HAVE YOU SIGNED UP FOR TEXT ALERTS? With summer flying upon us don’t miss out on your Dream trips, Layovers and Premium Pay flying when it becomes available. Sign up for text alerts to alert you of premium pay trips in open time, specific trips you want to fly, or even desired layover cities. Verify your Personal Information in Peoplesoft is accurate and up to date with a Phone number that allows Texts. This can be found in FA page Other Schedule Options, Open Trip Text Notifications, follow prompts. Published Roster it is the “accurate” view of your schedule. FA posting a trip for Grab or Direct Trade their name and position NOW shows. Be aware that if Trip was posted before the recent patch was done the FA name willNOT show this updated version. (FA may want to unadvertise trip and repost for Grab). When you look at your trip in your Roster pairing is in BLUE click on this trip (pairing) will appear with a PRINT option. Don’t forget to sign up for Crew Access Training Sessions! Please note the following dates and locations for upcoming Crew Access information sessions~ They begin next week! For this round we added dates at the Alaska Airlines Flight Ops building, in addition to the dates at the base. We hope this provides more options to accommodate your schedules. May 5th and May 12th we are looking to offer reserve training sessions. If you are on reserve and want to attend please sign up now! Also, class lists are finalized the day before~ if you want to attend a class please make sure you sign up prior to the class.